TWR and Jaguar began 1991's as one of the top competitors in both IMSA and Group C racing. Narrowly missing a seventh Le Mans win and the IMSA Championship, Jaguar would once more become World Sportscar Championship and Teo Fabi would win the Driver's Championship in 1991. Hampered by punitive regulations at Le Mans in '91 and more FIA mandated changes for the 1992 season, prototype racing was reduced to a former shadow of itself. Having accomplished what they set out to, TWR & Jaguar instead turned their attentions to the XJ220 supercar. 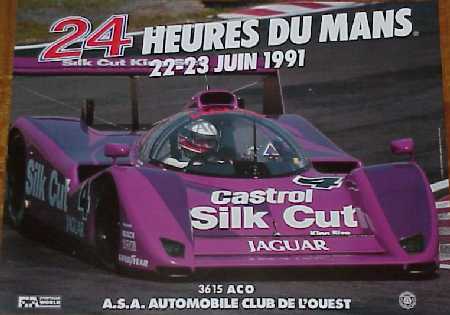 There would be two more runs at Le Mans in 1993 and 1995 with the XJ220 and another season in IMSA, but a great era of Jaguar racing was closing. 1991 XJR-12: For Le Mans in 1991, Jaguar turned again to its 7.4L V12 powered cars as its mainstay in the five car Silk Cut team, which included two of the new 3.5L V8 XJR-14's . The crew of Derek Warwick, John Nielsen & Andy Wallace finished in 4th place in Chassis #891. Jaguar would miss another Le Mans win due to punitive fuel and minimum weight regulations which did not allow them to use their full speed and allowed the lighter Mazda 787B to pip the Jaguar team in the end. Model by SPARK 1/43 1991 XJR-12: Davy Jones, Raul Boesel, & Alan Ferte had the best shot at winning Le Mans in 1991, finishing in 2nd place. Le Mans regulations on fuel consumption favored the lighter Mazda, which unhampered by such restrictions, was able to race unabated, while the Jaguars had to back off in an effort to conserve enough fuel to finish. It cost Jaguar a great 1-2-3 finish and helped solidify the decision to end participation in prototype racing after the '91 season. 1991 XJR-12: Suntec sponsored the fourth Jaguar entry (Chassis #290) driven by David Leslie, Mauro Martini and Jeff Krosnoff. Problems plagued the entry from the first hour, finally retiring Sunday morning. Suntec sponsored the Jaguar XJR-11 in the All Japan Sportcar-Prototype Championship series. This car previously finished 2nd at Le Mans the year before. Model by SPARK 1/43 1991 XJR-14: FISA regulations required that for Le Mans, teams must enter cars used in other Sportscar World Championship races. Jaguar entered two XJR-14's. The idea was to use the XJR-14's to gain good qualifying positions and concentrate on winning with the other team cars. Andy Wallace indeed qualified the car (Chassis #691) on pole. The car was however was withdrawn before the race over durability concerns. Model by SPARK 1/43 1991 XJR-14: Ross Braun designed the XJR-14 which set new technical heights, being radically different from its Tony Southgate designed siblings. Described as a F1 chassis with a two-seater body, the XJR-14 is powered by a normally aspirated Jaguar-Cosworth 3.5L HB V8. Derek Warwick, Martin Brundle and Teo Fabi drove this car (Chassis #591) to a first place at Monza. Fabi would take the Drivers and Jaguar the Manufacturer's Championships. 1991 XJR-12: This car (chassis #891) which finished 4th at Le Mans in 1991 was subsequently raced at Daytona in 1992 and finished 2nd overall to a Nissan Group C car and first in GTP class. It also raced at Sebring a month later and took 4th place to end its short but successful career. Model by SLOT.IT (customized) 1/32 1991 TWR Crew Suit: I had the opportunity to pick up this crew suit worn by Andy Whiffen at Le Mans in 1991. It fits with my other TWR Jaguar Silk Cut and Castrol automobilia collection. 1991 XJR-14: The Le Mans test car. IMSA GTP: Another Daytona Win! 1991 XJR-12D: IMSA regulations allowed the use of a larger 6.5L V12 in the endurance races. Two cars under the new Bud Light livery were entered at both Daytona and Sebring. This car (Chassis #190) was crashed in practice at Daytona by John Nielsen neither would race. Driven later by John Nielsen, Davy Jones & Raul Bossel, they finished 5th at Sebring. Model by HASEGAWA 1/24 1991 XJR-12D: The second Daytona car, Chassis #290, raced by Davy Jones, Scott Pruett, Derek Warwick and Raul Boessel, was locked in a see-saw battle with Nissan for much of the race, hopes of a win were dashed due to water pump failure. The XJR-12D would race again at Daytona in 1992 and take a class win, with a final attempt ending just short of another outright win in 1993. Model by ONYX 1/43 1991 XJR-12D: Davy Jones, Scott Pruett, David Brabham and Scott Goodyear finished 2nd at Daytona in 1992 in this car (Chassis 891), behind a NISMO Nissan. Having run at Le Mans in 1991 with a 4th place finish, #891 would be driven to 4th place at Sebring by Jones and Brabham in its final race. Daytona was the beginning of the fifth and final full season of IMSA competiton for TWR. 1992 XJR-14: The first XJR-14 IMSA win came ironically at the Nissan GP of Atlanta. Setting both qualifying and lap records at Road Atlanta in Chassis #791, Davy Jones led the race from start to finish to show both Toyota and Nissan there would be a season long fight for series supremacy. Model by Le Mans MINIATURES 1/24 1992 XJR-14:Only fielding one car due to financial considerations, with the success of the XJR-14 in Group C during the 1991 season, great expectations were placed on IMSA success during the 1992 IMSA season. Driven primarily by Davy Jones in sprint races, Jones would finish the year second in the Drivers Championship with three wins and Jaguar finished third in the Manufacturer's Championship. It was the end for Jaguar prototype racing . Models in 1/43 & 1/24 scales 1992 XJR-14: Davy Jones in Chassis #192 for the 9th round race at Laguna Seca, finished third behind the Toyota's. During the season, Jones sat on pole five times, 2nd fastest three times and 3rd three more. Clearly the potential was there, crashes in three races and two mechanical DNF's dashed Jaguar's final hope for an IMSA Championship. 1993 XJ220C: When the GT Class N endurance racing category was announced for 1993, the XJ220 was ideally placed to compete within the category. TWR (JaguarSport)who was producing the road cars for Jaguar developed the XJ220C, with carbon-fibre replacing most of the aluminium panels for strength and weight-saving. David Brabham, John Nielsen and David Coulthard won the GT class at Le Mans in 1993 (15th OA) with ease in Chassis #002, but were later disqualified on a technicality . Model by SPARK 1/43 1993 XJ220C: Powered by a modified 3.5L twin turbo V6, the XJ220C produced over 500 hp and outclassed the Porsche 911 Turbo variants at Le Mans in 1993. A blown tire on the Mulsanne straight and subsequent crash ended the race for Paul Belmondo, Jay Cochran& Andreas Fuchs in Chassis #003 while leading the GT class early on Sunday morning. A disappointing finish to what could have been another Jaguar 1-2 finish at Le Mans. Model by SPARK 1/43 1993 XJ220C: Armin Hahne, Win Percy and David Leslie's race was ended after six laps due to a blown head gasket in Chassis #001 at Le Mans in 1993. The Jaguar class win in its sister car was protested by a competitor and upheld on an obscure technicality. Like all other GT entrants, Jaguar had not run catalytic converters, but the race steward had insisted that they must. The FIA sided with Jaguar, but The Automobile Club de l�Ouest maintained their position and asked for the trophy back. 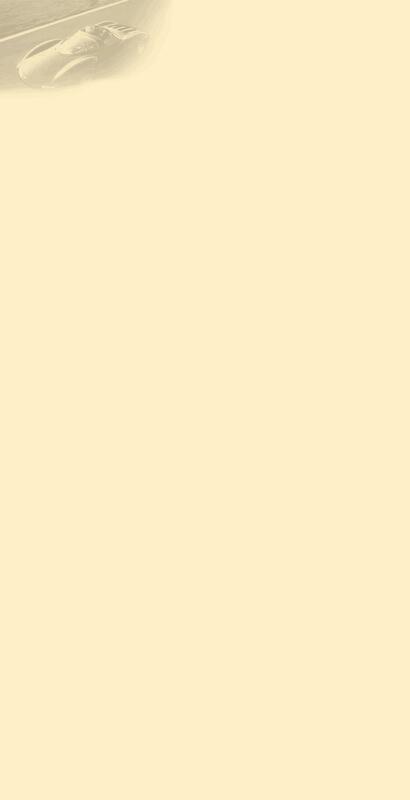 I doubt TWR ever gave it to them. Model by SPARK 1/43 1993 XJ220C: Another version of the 1993 Le Mans class winning XJ220 for the slot car track. Curiously, their is a driver and a co-driver in this version. Taking a ride at speed at Le Mans in and XJ220 would have been a real thrill! 1993 XJ220C: One of two cars entered by PC Automotive at Le Mans in 1995, using ex-TWR cars that ran at Le Mans in 1993, Bernard Thuner, Olindo Icobelli and Win Percy drove Chassis #001. Going well initially and running ninth, Icobelli hit a wall in the wet weather during the night, the crash ending the team's race. 1993 XJ220C: By 1995 the XJ220C was being outclassed by the faster McLaren F1 and Ferrari F40. Ex-TWR Chassis #003 being driven by Richard Piper, Tiff Needell and James Weaver was holding its own in fourth position when a crank shaft broke during the night. 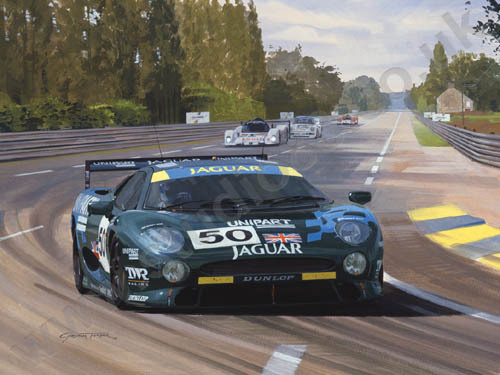 This was the last time that a Jaguar raced at Le Mans fifteen years in 2010. 1993 XJ220: This car raced in the 1993 Italian GT Championship, which was a series that ran from 1993-1994 as a supercar based championship. Sponsored by Martini and run by the Top Run team, this car was driven by Vincenzo Bianchi. This was a private team entry without any direct factory support and they ran two cars for most of the season with a couple of wins and several podium finishes. .
Model by MINICHAMPS 1/43 1993 XJ220: Entered by the Top Run Racing Team in the Campionato Italiano Supercar GT series in 1993. Driven by Paolo Cutrera, the team scored several heat victories and overall podium finishes. Cutrera finisheded behind Marco Brand driving a Ferrari F40 in the Italian GT Championship. This car (Ch. #SAJJEAEX8AXXPO107) was sold in 1995 to PC Automotive Jaguar and was run in select endurance races in the MIss Jaguar livery. Model by MINICHAMPS 1/43 1993 XJ220: This car raced in the 1995 Global Endurance GT Series at Donnington and Nurburgring 4 hour races. It was sponsored by "Miss Jaguar" perfume, the line sold by Jaguar. It was prepared in whole or in part by XK Engineering as a private entry for PC Automotive and driven by David Piper, Win Percy and Tiff Needall. The car retired in both races. It was entered for Le Mans in 1995 but did not qualify. Model by DETAIL CARS 1/43 1993 XJ220: What could have been? A prototype mock-up of the XJ220 had TWR continued racing in the GT classa and had retailed Silk Cut sponsorship. Note: This car retains the pre-production 12-cylinder engine used in the XJR-12. A look at what might have been. 1995 XJ6: One of the fastest XJ6's (X300) ever! This is the XJ6 raced by Nick Gwinnutt and as it appeared in the 2005 JEC (Jaguar Enthusiasts Club) saloon racing series in England. The JEC runs numerous class races throughout the season and features full grids of all types of Jaguar racing and production cars for some very close racing. Model by VANGUARDS 1/43 1997 Lister Storm GTL (G-Force): The Lister Storm uses the 7.0L V-12 Jaguar XJR engine used in the Jaguar Group C and IMSA GTP cars. The GTL was introduced in 1997 as an improvement on the GTS GT1 class car, with more aerodynamic bodywork. It scored a 4th in class finish at Daytona, Two Storm GTL's were entered at Le Mans in 1997, this car having been driven by Julian Bailet, Thomas Erdos and Martin Skaife. Unfortunatelt gearbox issues forced them out early, being classified in 40th place. The GTL project was dropped in favor of the Lister GT development. Model by SPARK 1/43 2001 Lister Storm GT: The Storm Gt was created to compete in the FIA GT Championship in Europe. This car was campaigned from the 2001 season, with the Lister team taking a 2nd place in the championship in 2003. Powered by a Jaguar 7.0L V-12 from the XJR Group 6 cars, the Storm produced 546 bhp and was capable of 208 mph. This is how the car was campained in the final season (2005) before Lister concentrated on the Storm LMP for Le Mans, as driven by Justin Keen and Liz Halliday. Model by SPARK 1/43 2003 Lister Storm GT: For the 2003 FIA GT Championship season, Lister ran this car with regular drivers David Sterckx and Andrea Piccini. After finishing 2nd at the Spa 24 Hours test race, they were joined by Gabriele Lancieri and Gaving Pickering for the 24 Hour race. They finished 10th. Lister Racing placed 2nd in the Team Championship in 2003, following their championship seasons in 2001 & 2002. This car was raced once more in the 2004 season and retired as Lister focussed on the Storm LMP project. 2003 S-Type: Pedro Lamy drove this Zakspeed Jaguar S-Type to victory at the 2003 Nurburgring and eventually won the series title. V8 Star was a German silhouettes touring car championship run from 2001-2003. Like Trans Am and NASCAR, the cars were fiberglass silhouette bodies on tube frame chassis and made to resemble production sedans. Powered by a 5.7L V8 producing 500 hp, these cars were a popular addition to the German touring car series (DTM). The turn of the new century finally saw a Jaguar entry in F1. However, under financed, the effort never did live up to its promise. It did give us Jaguar fanatics hope for a F1 championship, albeit briefly before Ford with its financial problems, pulled the plug and it all ended in 2004. In the USA, the Jaguar name would consistently be on the winners podium in the Trans Am series from 2001-2005 and again briefly at Le Mans, GT3 and in the American Le Mans series. 2000 R1: Jaguar Racing was formed in 2000 after the purchase of Jackie Stewart's Grand Prix team. Launched to much excitement and anticipation, the team could not produce the results, though not for a lack of trying by its drivers. Eddie Irvine (1999 world championship runner up with Ferrari) was the lead team driver, and he scored the teams only two podium finishes. Model by HOTWHEELS 1/43 2000 R1: Johnny Herbert formed the other half of the all British driving team. He scored Stewart's only F1 win in 1999, but suffered a frustrating season at Jaguar. Herbert ending the year being stretchered off at Malaysia after a suspension failure caused him to crash heavily and he retired from F1 racing. 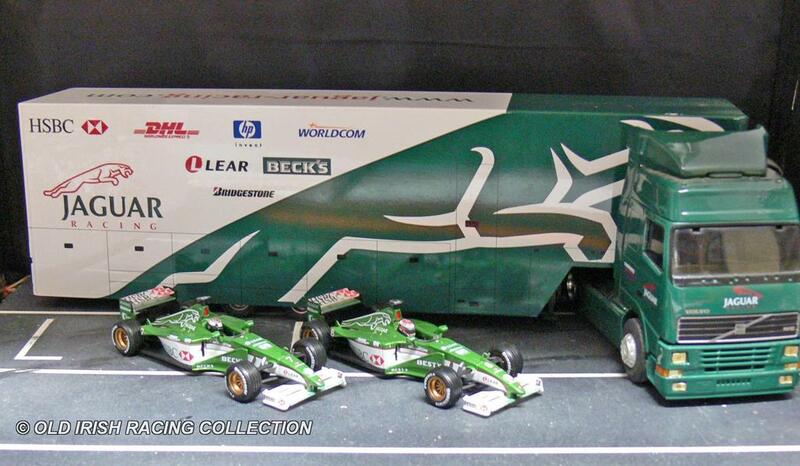 Model by HOTWHEELS 1/43 2000 R1: Another version of Eddie Irvine's car with proper Beck's logos, not the "Best" logo put on the models to avoid alcohol advertising on "toys". Model by HOTWHEELS 1/43 Jaguar Formula 1 Transporter: From the 2000 season, this is a good replica of the hauler used in Europe to transport the team from track to track. Rare? 2000 R1: This is the introduction and initial version of the R1, before all the sponsorships had been worked out. The race version was modified, primarily in the wings and trim tabs on the car for better aerodynamics. This version features Eddie Irvine and has his helmet as he raced for Ferrari the year before, albeit with Jaguar insignias. The model is also signed by 'Fast' Eddie. Model by HOTWHEELS 1/18 2000 R1: Powered by a Cosworth CR-2 3.0 V10 and variants throughout its four year F1 run, the Jaguar team had the potential, but suffered from a short budget and lack of adequate management and development. Bobby Rahal and Niki Lauda were unable to inject any magic in the team as its managers. If not the fastest or most reliable, they were the prettiest F1 cars on the grid. Model by HOTWHEELS 1/18 2001 R2: The 2001 season was not much better for the team. The change from Bridgestone to Michelin tires did not help and the team struggled. Despite the struggles, Irvine did get one podium finish (3rd) that season. He drove for the team again in 2002 then retired from F1. He was joined that year by Pedro de la Rosa. Model by HOTWHEELS 1/18 2001 R2: After the terrorist attacks on 9/11/2001 in the USA, Formula 1 made a difficult decision to continue with the Italian GP on the weekend following the attacks. Jaguar and Ferrari both made gestures of respect and mourning the victims of 9/11 by painting part of their cars black. Jaguar painted the engine covers on their cars, Ferrari the cars noses. Both Jaguars retired from the race. 2001 R2: Jaguar struggled to make the new Cosworth CR3 V10 engine competitive. Irvine scored nine points for the team during a season marked by internal turmoil and a lack of funds and experience to compete technically with the top teams in F1. Moments of brilliant promise, enough to keep the hopes of fans like me looking for the miracle that never came. Model by HOTWHEELS 1/43 2002 R3: Jaguar started the 2002 F1 season with hopes of building on the previous season. Eddie Irvine was again the team's principal driver, with Pedro de la Rosa in the second car. After an initial fourth in Australia, everything started to spiral downward due to poor reliability and a lack of horsepower. Some late season adjustments allowed Irvine to take 3rd place Monza. Model by HOTWHEELS (modified) 1/43 2003 R4: The 2002 season was a disaster for the team, with both cars only finishing two races. Mark Webber joined the team for '03 and the team stabilized in the results, but usually finished outside the points. Ford was not happy that it was not getting a better return on its investment and began to shrink team resources even further. The end was near. Model by HOTWHEELS 1/43 2004 R5: Mark Webber was able to qualify the car near the front and it showed great promise, but overall results had not significantly improved. To rise to the top of F1 in four years was an unrealistic expectation given the highly technical nature of F1 and level of competition. Regardless, Ford declined to invest more and brought the curtain down by selling both Cosworth and the F1 team at the end of '04 season. 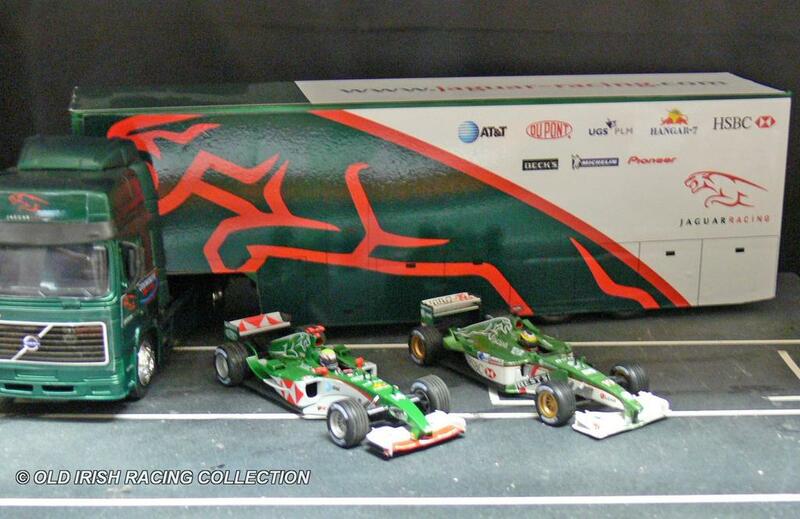 Jaguar Formula 1 Transporter: From the 2003 season on, Jaguar updated the racing teams logo. It did not improve their on track performance. Model by ELIGOR 1/43 Jaguar Formula 1 Transporter: Becks was a major sponsor throughout Jaguar's involvement in F1. This was a promotional model from Becks and capitalizes on their tie to Jaguar and the F1 team. Model by UNKNOWN 1/84 2000 Jaguar XKR prototype: A Old Irish Racing design study if Jaguar had continued in production car based racing, with a nod to the successful Castrol liveried proptotypes in IMSA/Group C.
Model by AUTO ART 1/43 2005 XKR Group 44: For the 30th Anniversary of their SCCA Championship, I created a commemorative Group 44 Jaguar XKR. Since the XKR is the spiritual successor to the E-Type, it seemed fitting. A bit of whimsy. 2002 XKRS: Paul Gentilozzi, Scott Pruett, Michael Lauer and Brian Simo drove this car to 5th overall and 1st in GTS class at the 2002 Rolex 24 at Daytona. Entered by Gentilozzi's Rocketsports Racing, the XJRS powered at that time by a Ford rather than a Jaguar V8 of 6.3 liters, qualified 15th behind the more powerful GTP cars. The strong finish by this car is a tribute to the durability of both the engine and the ability of the team to build stong cars that would win numerous races and a handful of championships in the SCCA Trans Am series. Model by SCALEXTRIC 1/32 2005 XKRS C: Paul Gentilozzi was the Trans Am Champion four times (two with Jaguar) and is the winningest driver in Trans Am history. He introduced the Jaguar to the series in 2001. In 2004, the production based 4.5L, 650 hp DOHC AJ-V8 engine was produced and dominated the series its final two years. Model by SCALEXTRIC 1/32 2005 XKRS: Mike Lewis drove the Autocon Motorsports Redline sponsored Jaguar to consistent top five finishes and a significant contribution to the winning the Manufacturer's Championship. The Jaguar XJRS used a production based engine situated in a tube frame chassis, with fiberglass silhouette bodywork. Model by SCALEXTRIC 1/32 2002 XKRS: Following his championship in the SCCA Trans Am series in 2000, Paul Gentilozzi entered his Rocketsports Racing Jaguar XKRS at the Daytona 24 Hours in 2002, finishing 5th overall and 1st in the GTS class. Rocketsports dominated Trans Am racing from 1998 through 2005. First with a Corvette, then a Mustang in 1999 and Jaguar's the remianing years. Gentilozi captured drivers titles in 2001, 2004 and teammate Pruett in 2003. 2005 XKRS: Paul Gentilozzi was kind enough to autograph this car for me. The nice folks at Rocketsports also sent a hat and pit pass holder. They have recently done some record breaking attempts with the new XF at Bonneville. Go to Rocketsports website for details. Model by SCALEXTRIC 1/32 2005 XKRS: Raced by Greg Pickett, founder of Cytosport the maker of CytoMax sports drink, sponsor of this car. Pickett was the 1978 Trans Am champion driving a Corvette. He was a front runner in the series, finishing third in the '05 championship points. Model by SCALEXTRIC 1/32 2007 XKR GT3: Apex Motorsport has developed the XKR for use in the FIA GT3 European Championship. Apex previously had teamed with Bentley to win the 2003 24 Hours of Le Mans. The XKR GT3, features a 4.2L V8 supercharged engine (475+ HP) and retains the aluminium body of its production cousin. Rocketsports Racing developed a similar car for Le Mans. 2007 XKR GT3: A chance meeting as the Apex involvement with Audi and the Bentley EXP Speed 8 were winding down, brought team owner Richard Lloyd and Jaguar designer Ian Callum together and sparked a new racing venture between Apex Motorsport and Jaguar. Model by MINICHAMPS 1/43 2007 XKR GT3: A plane crash took the lives of David Leslie who was to drive for Apex and team owner Richard Lloyd. They were on their way to test the car in France before the 2008 FIA GT3 season began at Silverstone. Model by MINICHAMPS 1/43 2007 XKR GT3: Despite the loss, the team carried on, contesting the 2008 season with Phil Quaife as primary driver. The best finish was 3rd at Spa. One is left to ponder the possibilities if the tragedy had not occurred. 2010 XKRS C: Paul Gentilozzi's RSR team brought the Jaguar name back to Le Mans in 2010. While the return was not as glorious as hoped with a DNF after 4 laps, the car showed promise in the ALMS races in the USA in GT2. Drivers at Le Mans besides Gentilozzi included Marc Goossens and Ryan Dalziel. Model by SPARK 1/43 2011 XKR: On a visit to Sebring International raceway, I couldn't help but notice that the pace car for the 60th Anniversary of the Sebring 12 Hour race in 2011 was a Jaguar XKR. With the help of Patto's decals, I created my own model of the Jaguar pace car. 2012 XK G3: The Swiss Emil Frey Racing Team campaigns a XK in GT3 trim in the Blancpain series. Frey was the first distributor for Jaguar and has a relationship with the Jaguar marque going back to 1926. This is the car as raced at the 24 Hours of Spa in 2014 where the team drivers Lorenz Frey, Gabriele Gardel, Fredy Barth, and Jonathan Hirschi were forced to retire in the 14th hour due to gearbox failure. The team continued to develop the car in the 2014 season and a strong finish of 9th in the Pro class at the Nurburgring 1000km. They have had a great start to the 2015 season with a podium finish at Silverstone and the blue cat is running strong! Model by SPARK 1/43 2012 XK G3: The Emil Frey Racing GT3 Jaguar is powered by Jaguar's 5.0L V8 which produces 500bhp and lays the power down through a Ricardo six-speed sequential gearbox. The aluminum bodied Jaguar also has a light aluminum chassis, making the big cr cat quick! Model by SPARK 1/43 2012 XK G3: Emil Frey Racing continues to compete in the Pro-Am division of the Blancpain Endurance Series in Europe. Even though XK production ended at Jaguar in 2014, the Swiss Frey team continues to develop and improve their XK GT3 cars, often competing two cars at major races. The highlight each season is the Spa 24-Hour Race. In 2015, the team with drivers Lorenz Frey, Jonathan Hirsiti, Gabriele Gardel and Fredy Barth driving finished 27th overall and 9th in class at Spa. The team finished the 2015 season 5th in class and won their class at the season finanle at the Nurburgring. 2012 XK G3: At the Spa 24 Hours in 2016, Frey Racing for the first time ran two cars in the GT3 Pro class. This car piloted by Markus Palttalia (2016 Spa winner), Jonathan Hirschi and Christian Klein had a very promising start, with Palttalia putting the car in 1st position overall by lap 66. Unfortunately, a collision with a back marker and the hour spent repairing the damage cost the team the lead. They finished 49th overall and their sister car finished 53rd after it had been sidelined for a time due to mechanical problems. Frey remains the only team to privately develop a GT3 car in the Blancpain GT Series Endurance Cup. Model by SPARK 1/43 2012 XK G3: At Spa in 2017, Emil Frey Jaguar Racing was back with two team cars for the 24 Hour race. Despite a strong performance in qualifying, a broken suspension would take out this car driven by Christian Klein, Marco Seefried and Jonathan Hirschi on the 69th lap. The sister car would succumb to mechanical problems a few hours later. Despite many set backs during the 2017 Blancpain Endurance Series, the team had a strong finish to the season, with the trio that drove this car at Spa finishing 10th at Barcelona and its sister car finishing 11th. 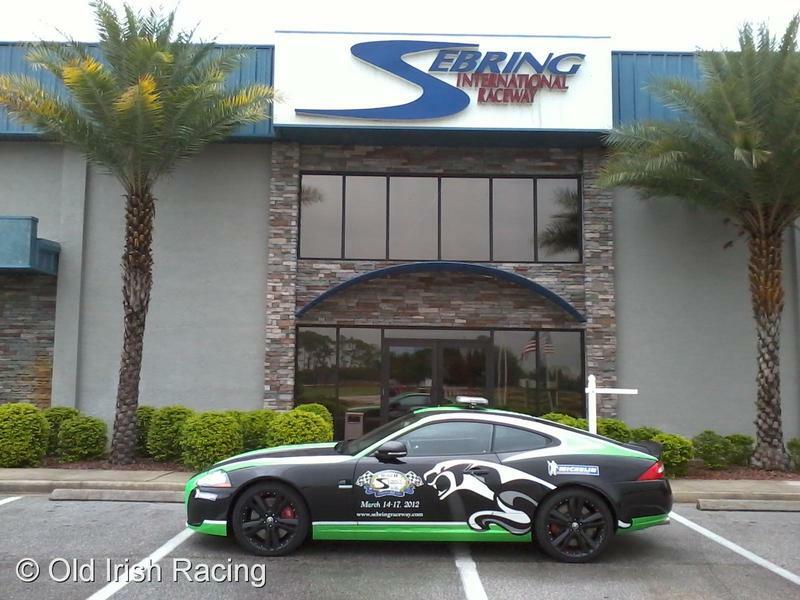 The team plans to run its evergreen Jaguar XK's in the 2018 series, both cars in the GT3 Pro Division. Model by SPARK 1/43 I'm waiting for Frey Racing's call to go racing! We are waiting for the next chapter in Jaguar Racing to be written. In the meantime, Jaguars of all types are still very active in vintage and historic racing around the globe.